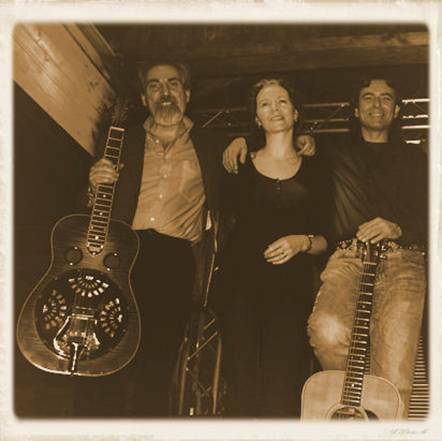 Banjo- and guitar-player, singer, and bandleader Danilo Cartia reports from Italy that the Blue Frets Trio will be playing from 20:30 on Friday 2 March in the 'Four Green Fields', Via Costantino Morin 38, Rome; admission is free. 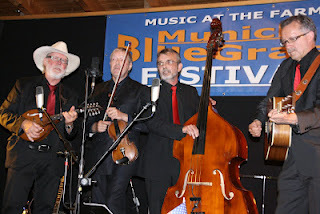 The organising committee of the Spring Bluegrass Festival in Willisau, Switzerland, has announced the full programme for the 13th edition of their successful event. Their updated website features short presentations of all bands appearing (in German). 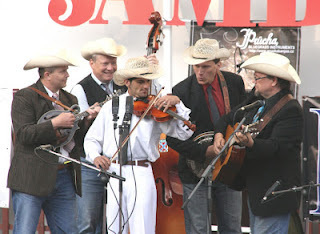 The 13th Spring Bluegrass Festival takes place at the Swiss Agricultural Museum in Alberswil, next to Willisau, Canton Lucerne, Switzerland, on 19 May 2012. Advance ticket sales have been strong so far and a sold-out festival is likely. 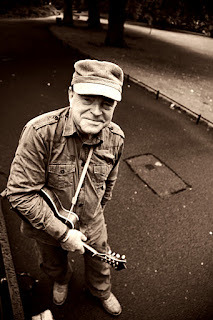 European Music Day (21 June): a place for bluegrass? The love:live music movement, presented by Music Network in association with RTÉ Lyric FM and funded by the Department of Arts, Heritage and the Gaeltacht, was launched on 22 Feb. 2012 as Ireland's part in the Fête de la Musique; more can be read about it on the Bluegrass Ireland Blog. Similar arrangements exist in other countries of Europe. 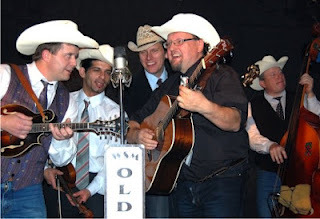 Bluegrass Cwrkot (Czech Republic) and Strictly Bluegrass (Germany) [photo below] will be playing the Bluegrass Night on 3 March 2012 presented by the German Bluegrass Music Association as part of EBMA's European Bluegrass Summit in Bühl. The concert, at the Bürgerhaus Neuer Markt in 77815 Bühl/Baden, starts at 20:00. Tickets can be ordered through the GBMA website. The European Bluegrass Summit is held in Bühl for the fourth time and has been instrumental in pulling together the scene across borders. 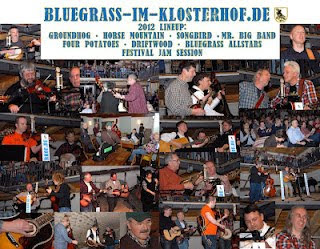 With these two fine European bluegrass bands, bluegrass friends from all over Germany as well as Summit participants are looking forward to an entertaining evening. 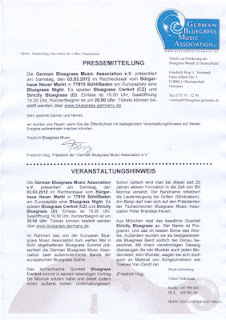 The text in German of the GBMA press release appears on the left; click on the image for an enlarged view. On the concert evening, doors open at the Bürgerhaus Neuer Markt at 7.30 p.m., and the concert starts at 8.00 p.m. Tickets can be booked online. Below: Bluegrass Cwrkot at an outdoor location. 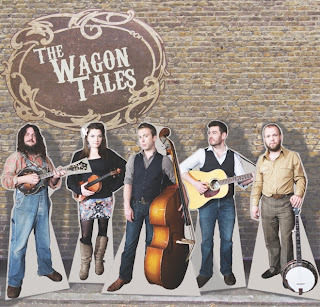 Thanks to Adele Ingram of One-A-Chord Music Promotions in Northern Ireland for the news that Wookalily, Ireland's premier all-woman, bluegrass-and-more band, have been invited by Tom T. and Dixie Hall of Good Home Grown Music (USA) to feature on the brand new Daughters of Bluegrass recording project. The 'Daughters of Bluegrass', originated as a concept by Lorraine Jordan and Gena Britt, now comprises some fifty women bluegrass artists. 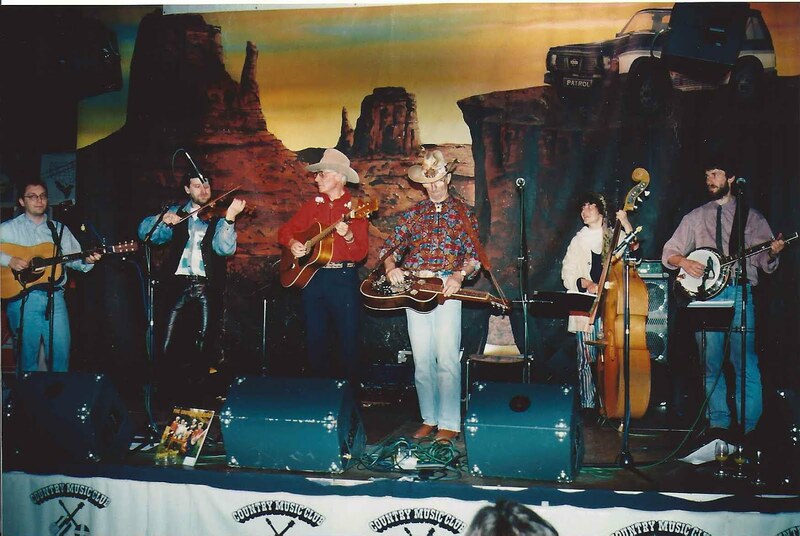 Their first album, The Daughters of American Bluegrass, was released on CMH Records in 2005 and nominated later that year for the 2005 IBMA Recorded Event of the Year. 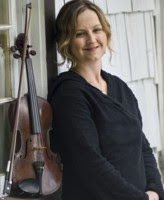 The Daughters have subsequently recorded two more albums: Back to the well, winner of the 2006 IBMA Recorded Event of the Year, and Bluegrass bouquet, winner of the 2009 IBMA Recorded Event of the Year for the song 'Proud to be a Daughter'. Their fourth album will include names such as Sierra Hull and Dale Ann Bradley. This year they are also including women from all over the world, and Wookalily will be representing Ireland. More details are on the Bluegrass Ireland Blog. 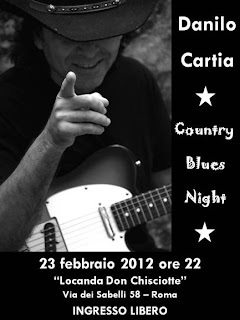 Banjo- and guitar-player, singer, and bandleader Danilo Cartia reports from Italy that he will be presenting a Country Blues Night on Thursday 23 Feb. 2012 at the Locanda Don Chisciotte, Via dei Sabelli, Rome. The show begins at 22:00; admission is free. The newly launched Unsigned Only Music Competition, from the team behind the International Songwriting Competition, is fast approaching its 5 March deadline for artists to enter. Designed for solo artists, bands, and singers who are not signed to a major record label, Unsigned Only's goal is to find an outstanding, talented performing artist: a band, singer, or solo artist, a newcomer or veteran, raw or polished - the 'gem' that needs to be discovered. Judging criteria include vocals, performance, songwriting, and originality. ... This is a once-in-a-lifetime chance for an artist to directly network with the top echelon of record company professionals and get guidance, advice, feedback, and networking opportunities... The judging panel is comprised of an impressive group of recording artists, producers, and top-level music journalists. The Grand Prize Winner will be awarded $5,000 in cash (plus additional prizes) and one-on-one mentoring by an elite group of record company executives. First Place and Second Place winners will also be selected in each category. Entries are being accepted now until March 5, 2012. Winners will be announced in July, 2012. Categories include: AAA (Adult Album Alternative), AC (Adult Contemporary), Christian Music, Country, Folk/Singer-Songwriter, R&B/Hip-Hop, Rock, Pop/Top 40, and Vocal Performance. All entries must be original music except for the Vocal Performance category which accepts original or cover songs. Judging criteria in the Vocal Performance category will be based solely on the quality of the vocals, thereby allowing singers who do not write their own songs the opportunity to enter. For more information, please contact Candace Avery at +1 615.251.4441 or by e-mail. For entry and general information, please go to http://www.unsignedonly.com. It was a great concert! 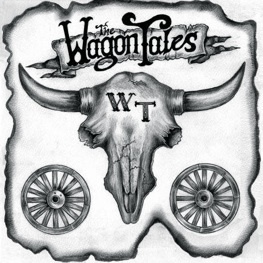 The first part bluegrass, swing, gypsy jazz, the second part western swing. The audience just loved them! Above, Regula Sulzer, the promoter, welcomes the audience and introduces the Toy Hearts. Many more of Lilly's photos from the show can be seen here. I will also spend more time on crossing the US/Canada border, than on entering European countries (the other area of the world I have touring experience in). This is mainly because the US/Canada border is fraught with a lot more peril than the European ones. I’ll elaborate on it later, but generally, when entering Europe, you just follow the green sign, they hand you a free cup of strong coffee and a croissant, and you’re on your way. There is more to it than that, as Chris says; and the EBMA advises bands who are thinking of touring Europe to read its White Paper on the subject. Meanwhile, read the whole of Chris's piece here. 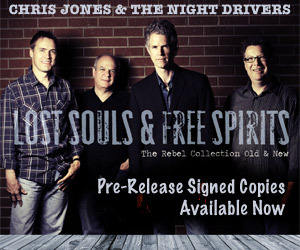 The image above is about his latest album, Lost souls & free spirits. ... reconnecting with old friends and fans and exchanging memories and photos of the old days. It's well worth joining Facebook if only for this page. Come and join us with your own contributions. The site already holds a treasury of photos of British bluegrass bands and individual musicians from the past decades, and will be a valuable source for historians of the music in Britain - and perhaps an example to be followed in other countries? 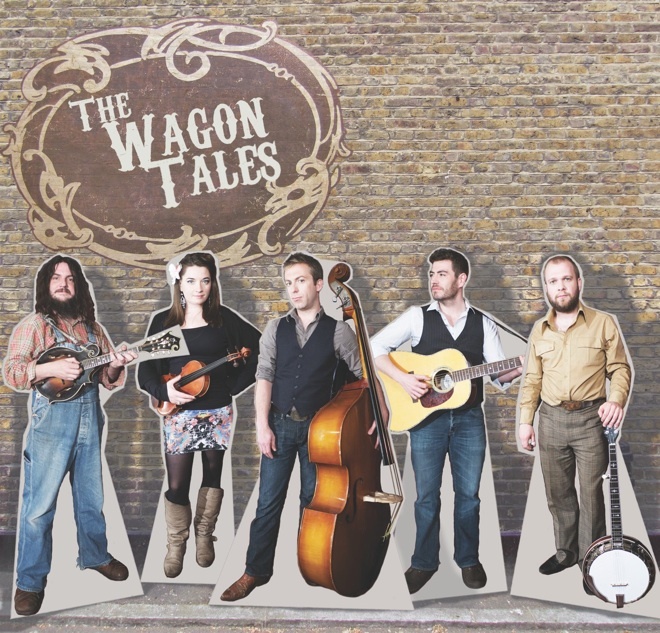 The Niall Toner Band from Ireland now have their own digital press kit online, as part of the service provided by AirPlay Direct, the US agency making bluegrass recordings available for radio presenters. We hope you enjoy our latest single, 'Tomorrow', now available for download on AirPlay Direct. Our USA success has been incredible. Thank you for your support. Pinecastle Records has been kind enough to sign us to their label. We are excited to work with them! Visit our website to learn more. The NTB are booked in the US by Mountain Music Entertainment. The award-winning, world-class banjo-player and bandleader Svaťa Kotas (SK) will be featured in the next issue of the EBMA's own magazine, Bluegrass Europe. 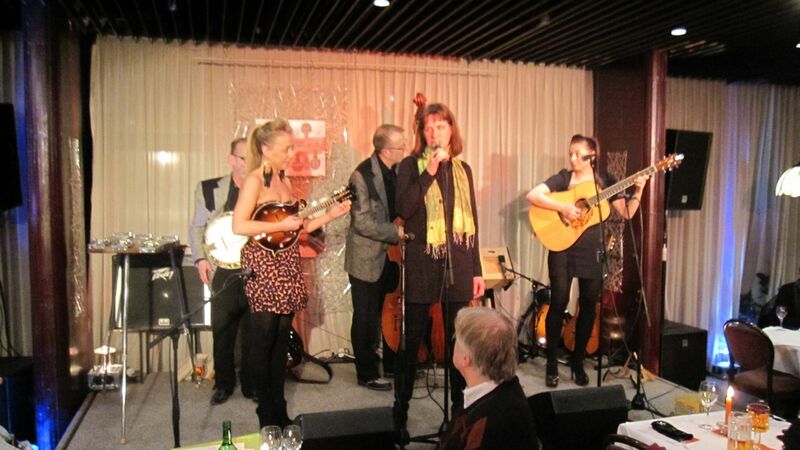 Lilly Pavlak (who took this photo) stayed longer in the Czech Republic than she had intended, so that she could see the Svaťa Kotas Band in concert at Brno on 12 January. Her report on the concert will appear in Bluegrass Europe #83, with her review of the career of Svaťa Kotas, founder (1983) of the band Fragment. His solo album Late at night (1993) was the first instrumental acoustic project in the Czech and Slovak Republics. 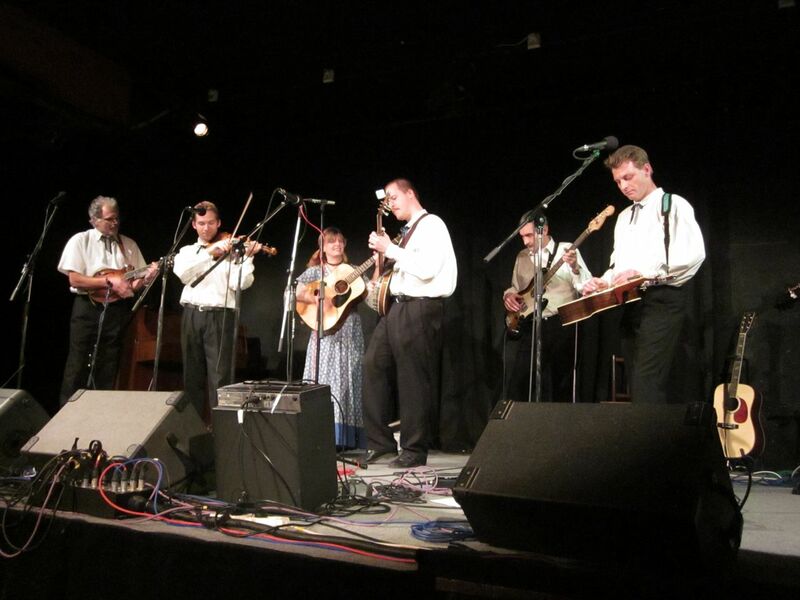 Read much more (with more photos from the concert) in Bluegrass Europe #83. 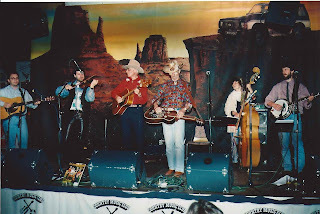 The photo below (also by Lilly) shows Early Times, who opened for the Svaťa Kotas Band at Brno. 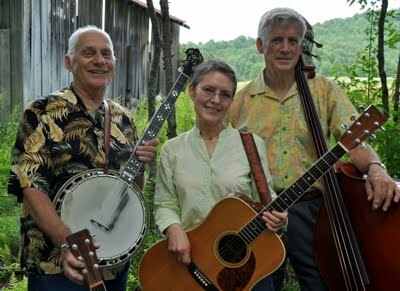 The Czech Bluegrass Music Association is searching for additional gigs for Eddie and Martha Adcock with Tom Gray in Europe. 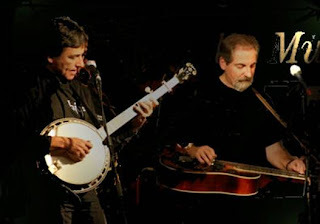 Their gig at the Banjo Jamboree festival in Čáslav (90 km east from Prague) on 16 June is being negotiated, and they are available one day before - on Fri. 15 June, and then in the following period: Sun. 17-Sun. 24 June. For more information contact CzBMA chairman Petr Brandejs by e-mail or mobile phone (+420 777122569). See a Bluegrass Today feature on the foundation of the group a year ago from these legendary components. If you're interested to advertise your festival or event in the 2012 EWOB Guide please let us know, and send your ad (in pdf format, please) by 16 April to me by e-mail. Did you know that, apart from its own website, the European World of Bluegrass Festival in the Netherlands has its own Facebook page? What better way to stay up-to-date, read last-minute updates, find interesting links, and have a possibility to share any EWOB-related news items? Apart from festival-related information, we aim to provide information on upcoming events, misplaced instruments, workshops, etc., and hope this to be a regular meeting place for global bluegrass lovers. Stay up to date by visiting and Liking our page. New items will then be instantly accessible and brought to your attention. 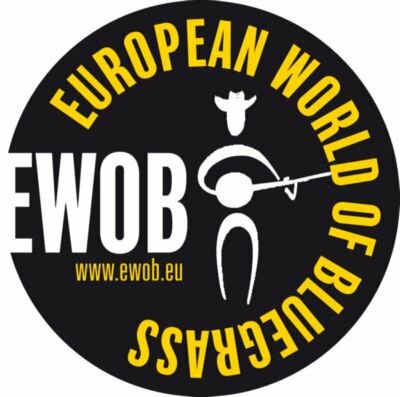 Follow the 1600 people who have already done so and become part of the virtual EWOB family! We are looking forward to meeting you both in Voorthuizen and on Facebook. The 15th European World of Bluegrass Festival takes place on 17-18-19 May 2012 at Voorthuizen, the Netherlands. 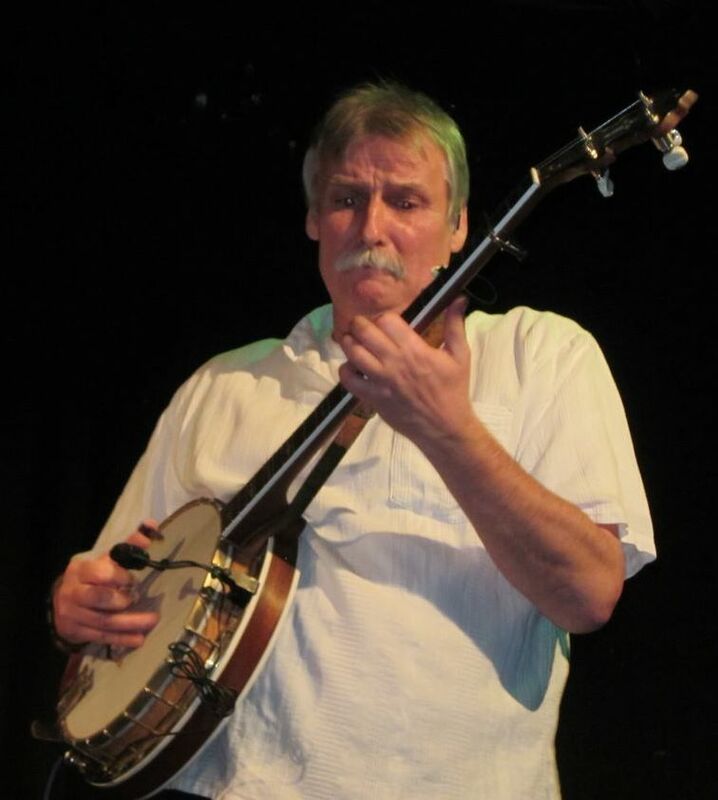 Sore Fingers Week takes place at the usual location, Kingham Hill School near Chipping Norton in Oxfordshire, 9-13 April 2012, and promises to be another classic event with a stellar line up of bluegrass tutors and old-time tutors. The bluegrass classes are bursting at the seams. 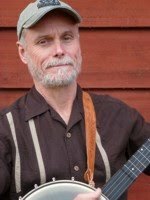 We have three bluegrass banjo classes with Richard Bailey, Danny Barnes, and Richard Collins! With the old-time classes - Erynn Marshall (above left; fiddle) and Carl Jones (above right; banjo) - not enough people are booking up to make these courses pay. Surprisingly, Carl’s course still has a lot of vacancies. Erynn’s class is looking reasonable, but five or six more students would certainly give it a boost. So, if you are intending to get up to Kingham this year, we look forward to receiving your booking form. And if you’ve never been before, you should give it a try. It’s probably one of the nicest musical experiences you will have. Full details are on the website. Hope to see many of you at Sore Fingers Week 2012. Danilo Cartia and Michele Anselmi will be perfoming bluegrass, blues, and ballads from 22:00 on Friday 3 Feb. 2012 at the 'Locanda Don Chisciotte', Via dei Sabelli 58, Rome, Italy. Admission is free.